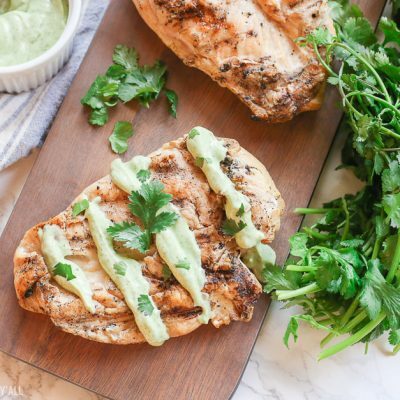 Healthy Cilantro Avocado Cream Sauce Chicken combines fresh cilantro and avocado with healthy greek yogurt and lime in a food processor for a creamy flavorful sauce that can be drizzled over any grilled meat or salad and takes just minutes to make! I know that summer seems like a far stretch for many of you right now but here in Atlanta it’s 80* degrees today. 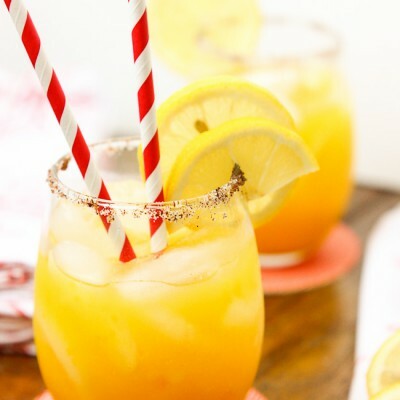 So basically spring is here and so my mind goes straight to spring and summer recipes that can enjoyed outside. 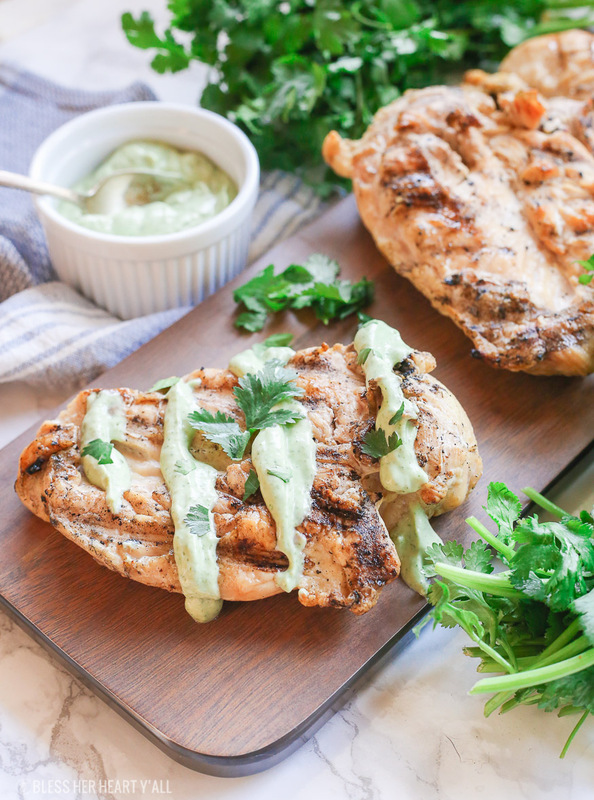 In our house we are big fans of grilling meats and then putting our own spin on sauces and dips in little competitions to see who can make the better sauce. 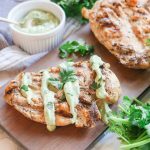 When I decided that I wanted to make a light and creamy sauce to drizzle over my chicken I immediately thought that avocado needed to be in the mix somewhere. Avocado sauces have never let me down. I absolutely love the sauces in my garlic avocado pasta and the baha avocado pasta doesn’t ever disappoint either. 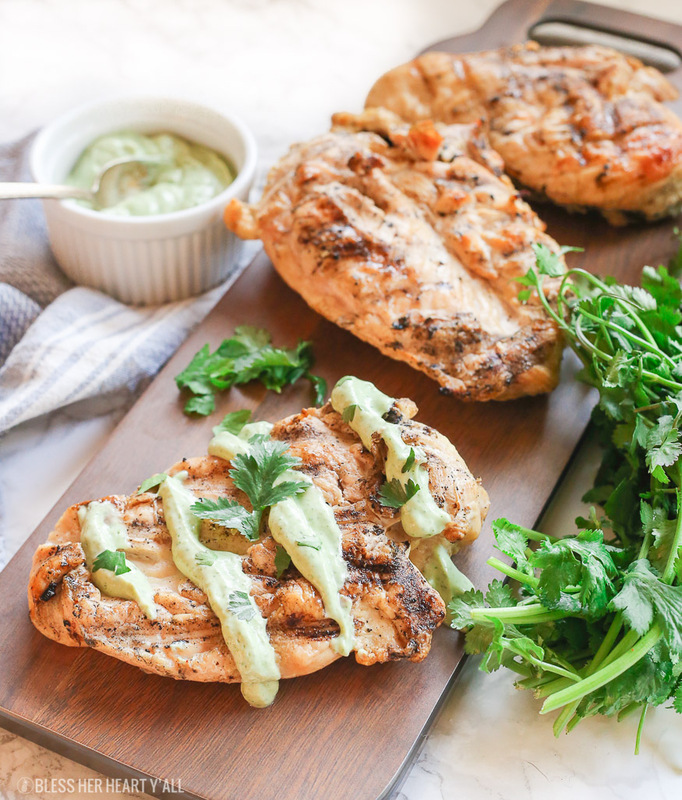 So I mixed it up a little bit and went with a creamy mixture of avocado, greek yogurt, lime, sea salt, and massive handfuls of fresh chopped cilantro for a thick and creamy avocado sauce that has all the best flavors of summer. 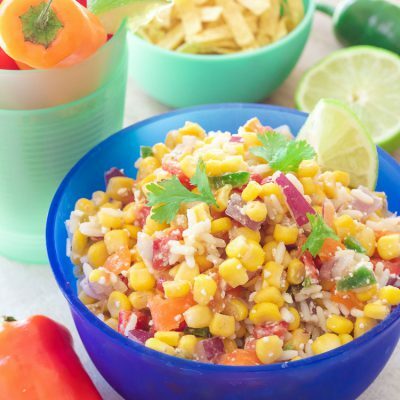 Combine all ingredients except the water in a food processor and process until thick and smooth. Add in the water a little at a time and process until the desired sauce thickness is achieved. Enjoy! I would highly recommend using a blender or better yet a food processor to mix up this cilantro avocado sauce. That way the cilantro will blend up into very fine (and non-chunky) consistency. You can drizzle this skinny sauce over any meat and it’s delicious. My preference is grilled chicken but pork, beef, or over a salad is so simple and tasty too. Store any extras in an airtight container in the fridge for up to 2-3 days. 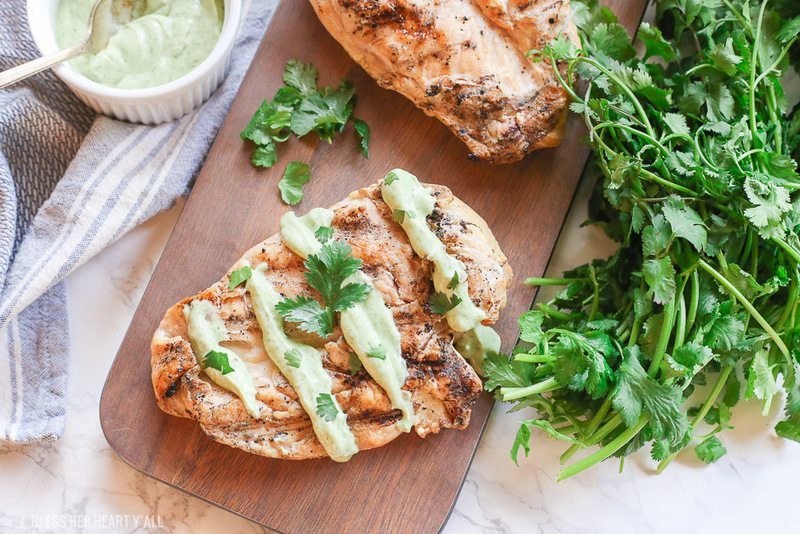 The color may change slightly to a more brown color the longer the avocado sauce sits in the fridge. A nifty food processor. A food processor will chop up that cilantro into really fine bits making your creamy sauce very smooth. A high-quality nonfat plain greek yogurt. Legit sea salt that’s delicious.